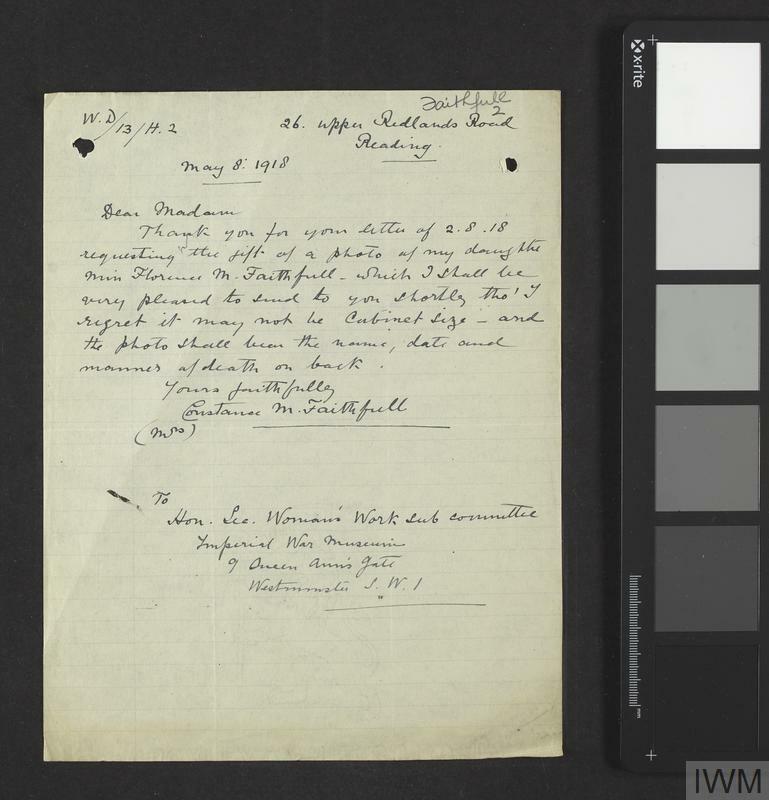 Leila Faithfull wrote to the committee offering her services in June 1940. Her application was supported by letters from Oliver Brown (Leicester Galleries) and Sir Edward Marsh (6). Faithfull was offered facilities to paint WVS subjects, which she did, submitting some pictures in August 1940, of which the Committee purchased IWM:ART LD 428 for £7 10s (16). Faithfull uses a different title for it in (17). Faithfull's letter also mentions having sold a picture to Sir Kenneth Clark. There was no further correspondence until June 1944, when a commission was given to paint a scene of Americans in Hyde Park (LD 4360) for 25 guineas. Due to the smaller size of the final picture, Faithfull was paid 10 guineas. She also asked to paint a scene in the Tuileries Gardens in Paris, and to travel to Italy, Egypt or Palestine (39), but this was not allowed. A further picture of Faithfull's was declined in 1945 (42) but a triptych of VE Day Celebrations (IWM:ART LD 5202) was purchased for £45 (45ff).